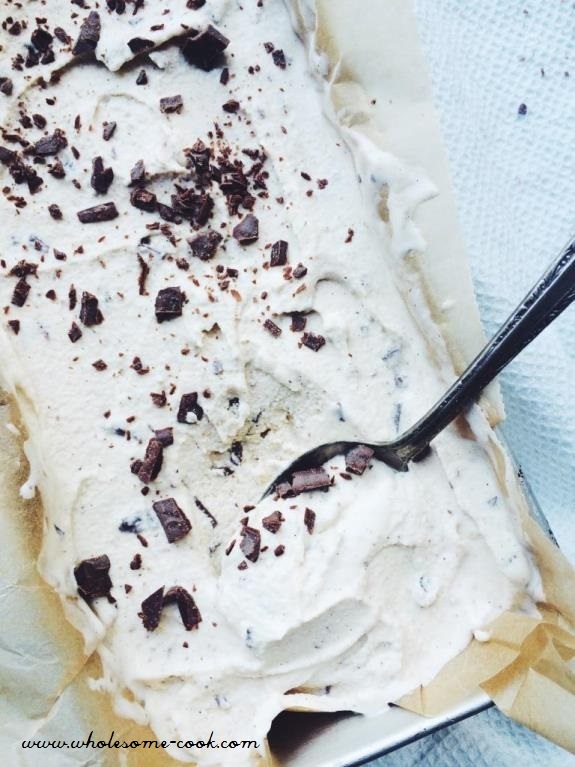 For 13+ Healthier Ice Cream Recipes look no further. You can make these at home using just a handful of whole ingredients. 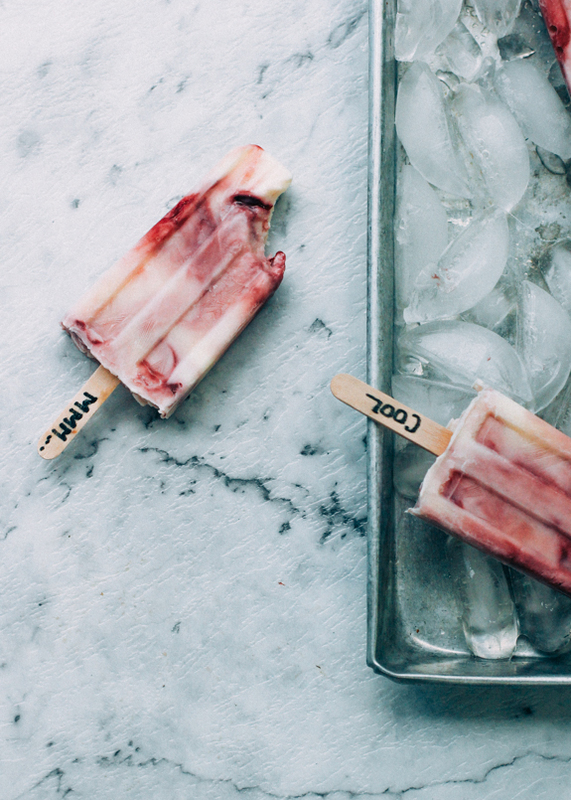 Serve as ice cream, ice pops and soft serve! Includes no-churn, sugar-free, egg-free and dairy-free options too! 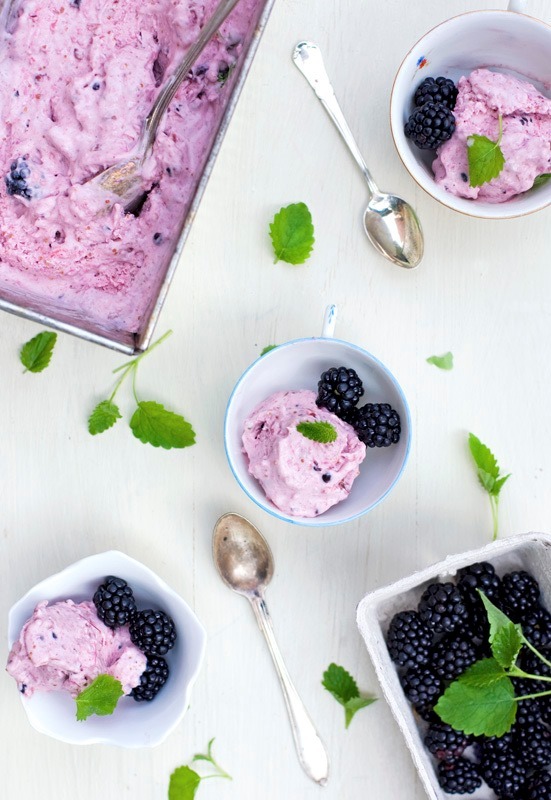 To be honest, I can’t recall the last time we bought ice cream or ice blocks from the shops because these healthier alternatives – homemade ones, are just as good and satisfying as the real thing. 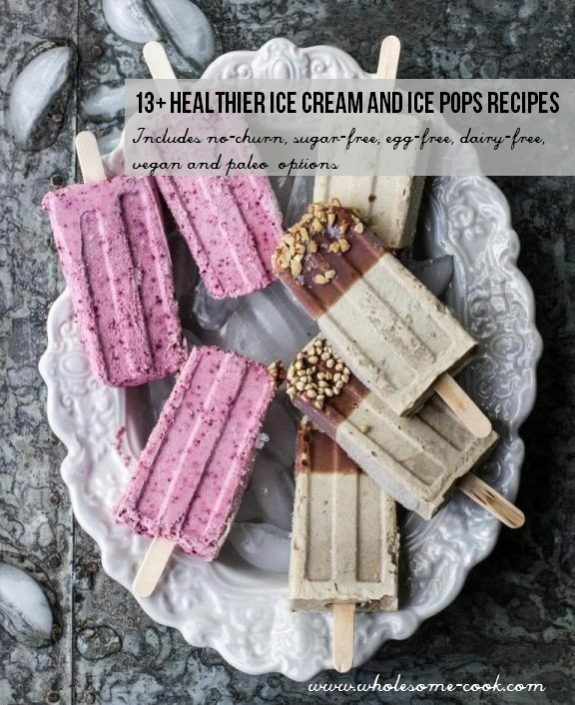 This is why I provide over 7 homemade wholefood ice cream and ice pop options in The Wholesome Cook Book – like these two below… Caramelised Banana Choc Tops and Breakfasty Berry Ice Pops. You can fancy them up by adding nutritious ingredients and mix and match flavours to your own likes, dislikes and dietary needs. While some of these are sugar-free and low sugar, you can tailor others to your liking using your sweetener of choice. 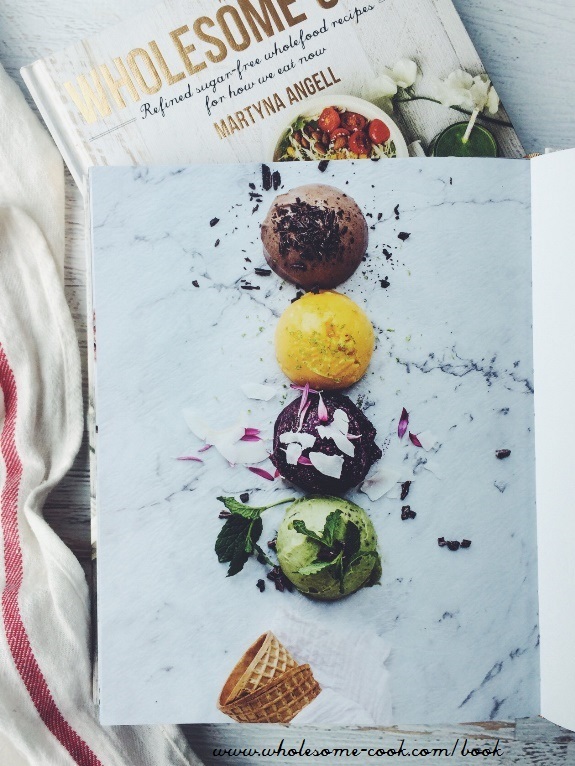 More Wholefood Ice Cream Inspiration from The Wholesome Cook book. 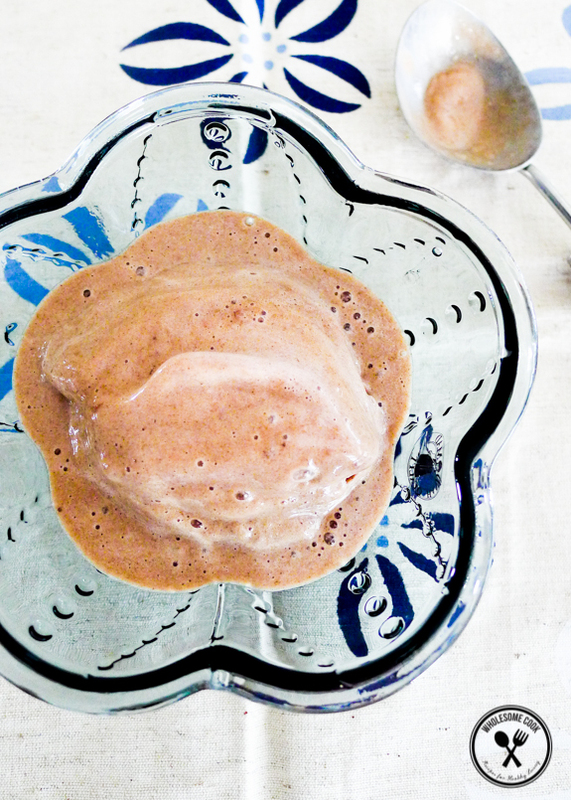 Check out page 311 of for these simple wholefood blender sorbets. Mint choc chip anyone? YUUUM! For a dairy-free version: use a non-dairy milk of your choice, coconut yoghurt or coconut cream. For sweetness: add a little honey, rice syrup, a few stevia drops or maple syrup because once frozen, foods taste less sweet. 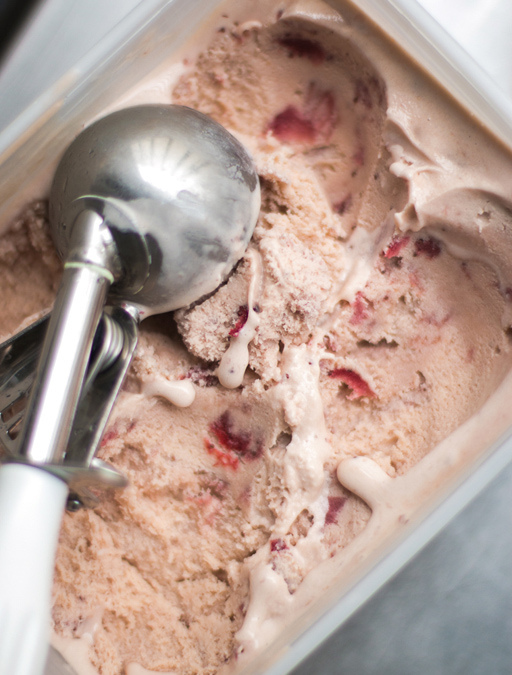 Prevent freezer-burn on ice cream: keep ice cream in an air-tight container or a special ice cream box in the freezer. If using loaf tins, place a sheet of trimmed baking paper on top and press into the mixture gently to remove any air. 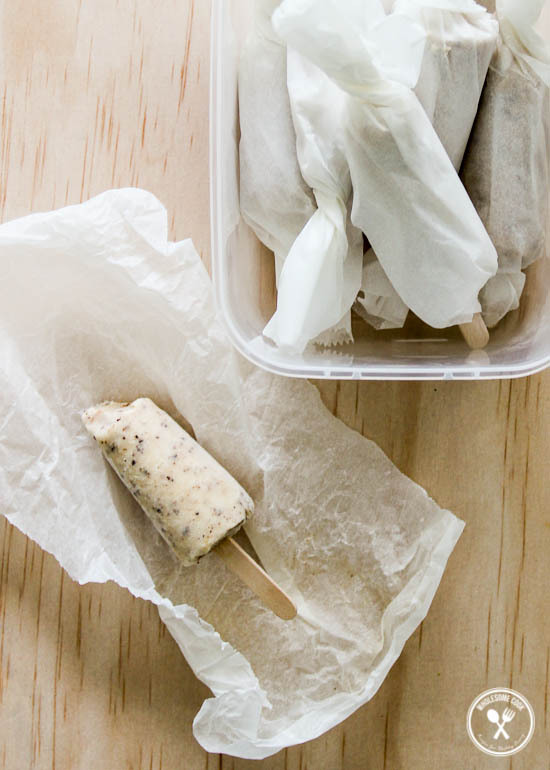 Prevent freezer-burn on ice pops; remove them from moulds as soon as they’re set and wrap each snugly in some baking paper. Keep wrapped pops in a zip lock bag. 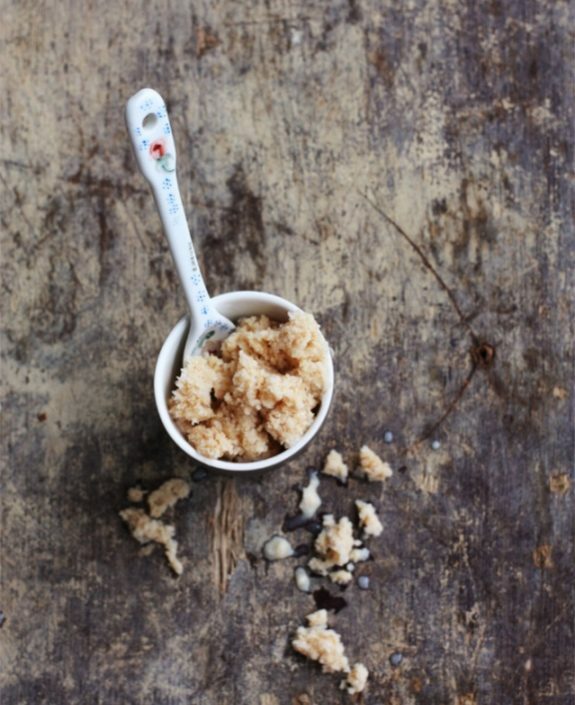 Create a softer texture in low fat low sugar ice creams: add some arrowroot flour, xanthan or guar gum to the mixture. Adding a tablespoon of vodka per 500ml apparemtly also works because of alcohol’s low freezing point. I’m sure you’ve heard of nana ice cream. It’s simple and made with frozen bananas. Add a little cacao or peanut butter to the blend (banana split-style) and you’ll be set for dessert – get the recipe from the archives here. 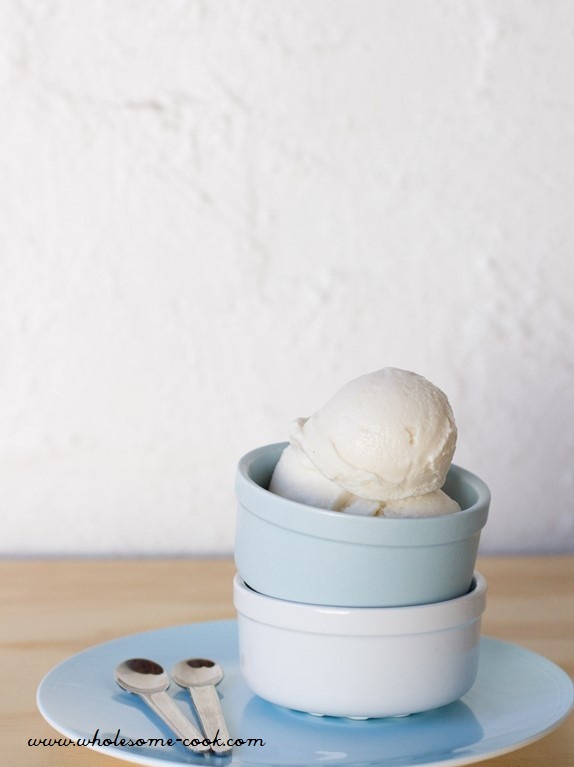 A super simple blender ice cream if you’re after plain vanilla without the additives. No ice cream machine required. Simply freeze some milk and cream (coconut cream or dairy-free milk) into ice cubes then blend a handful with a ratio of 2 milk to 1 cream in a power blender with a little vanilla powder or essence. You can sweeten it with honey, rice syrup or liquid stevia as well. 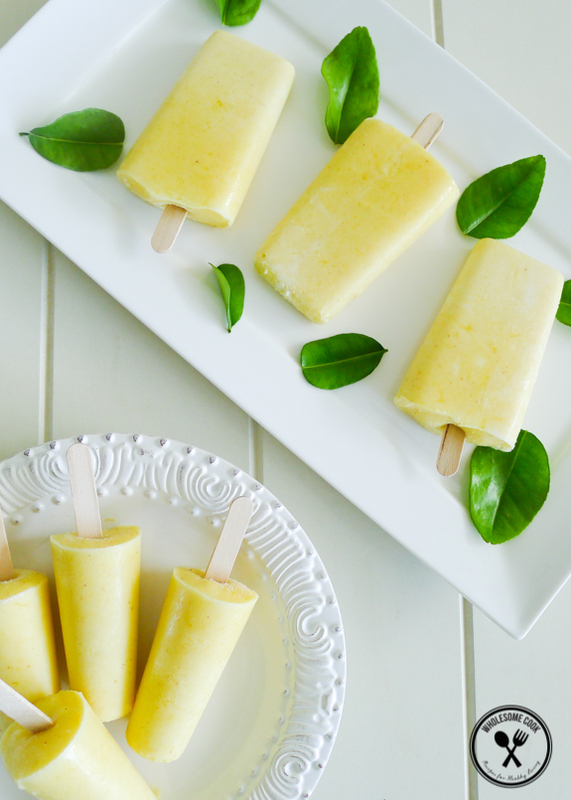 Head over to Emma’s My Darling Lemon Thyme blog to get this lush dairy-free recipe. It’s one of my favourite flavours and it’s a recipe that made it from the blog here into The Wholesome Cook book here. Yum! A summer fave! It’s been doing the rounds on Instagram, sadly not always credited to the source… but here it is simple, sugar-free mangoes and yoghurt (including a dairy-free version) from the archives here. 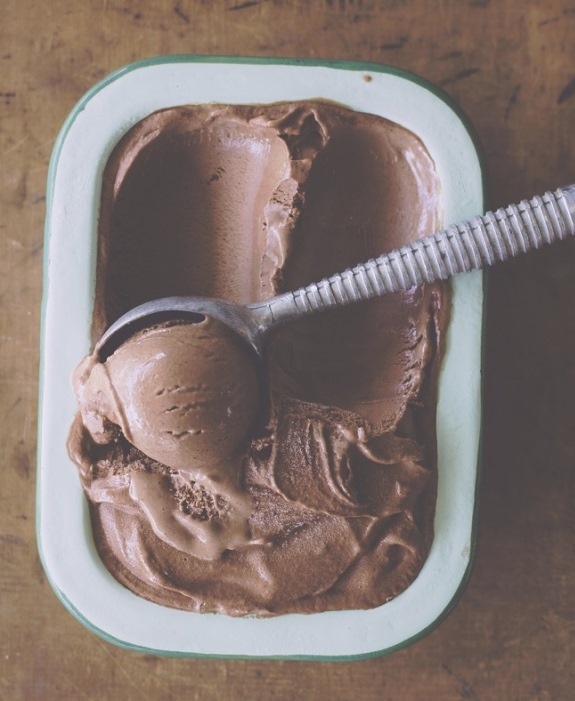 This amazing choc top recipe is one of the 7 delicious REAL FOOD ice cream recipes in The Wholesome Cook book. 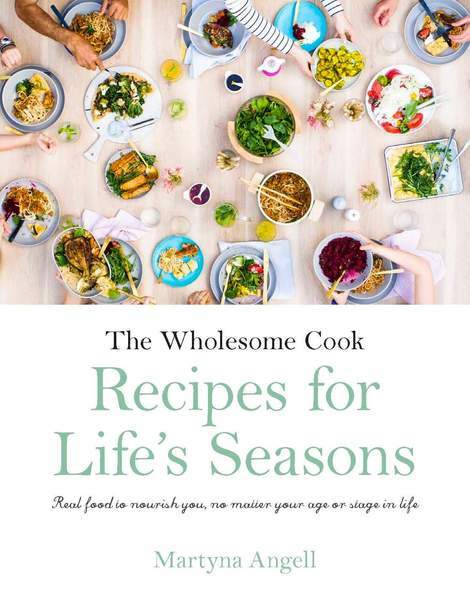 Adaptable for dairy-free, paleo and vegan diets. 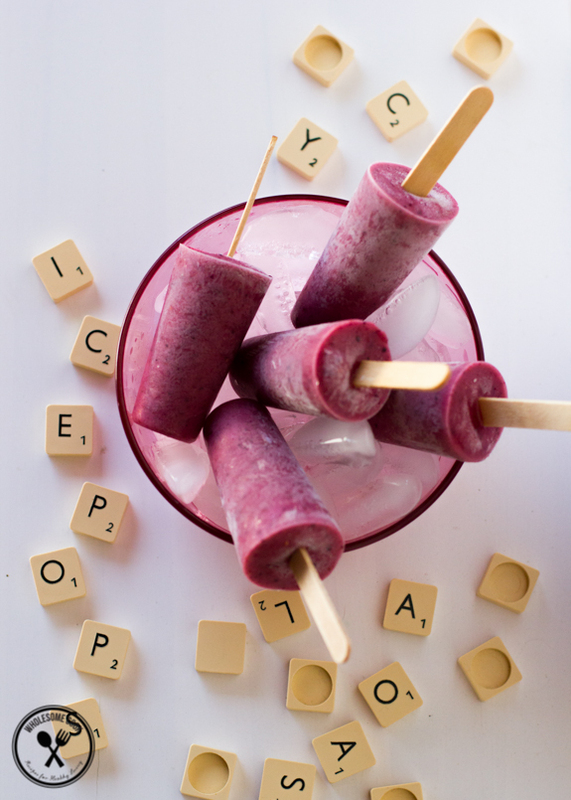 You’ll also find the recipe for the Breakfasty Berry Ice Pops, pictured in the featured image there. Need I say more? Adaptable to be dairy-free and vegan as well. Get the recipe here. 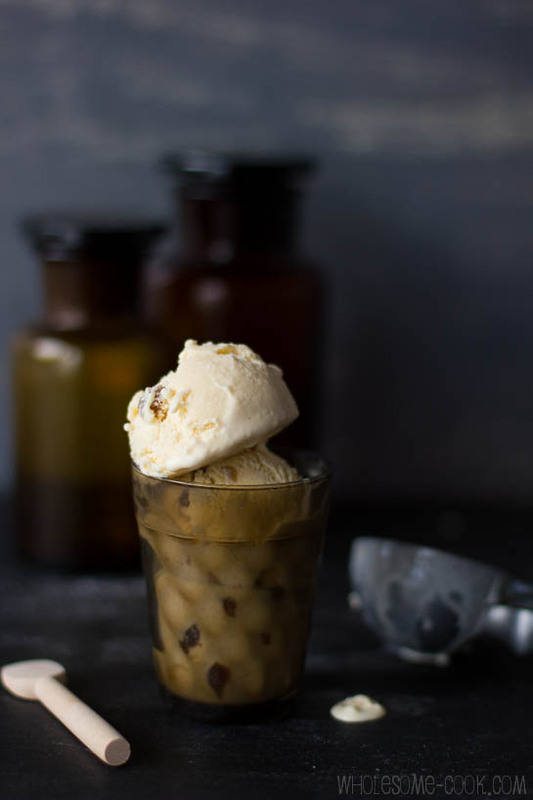 There is some sugar in this recipe by David Lebovitz (which you can swap out for your sweetener of choice), but I was most intrigued by the use of miso (a salty fermented soy bean paste). I bet these are a flavourful combo. Nothing could be easier than blending 2 cups of frozen berries with 1/2 cup of your choice of milk and freezing into ice pop moulds. Summer on a stick. This recipe by Green Kitchen Stories looks as good as it sounds. 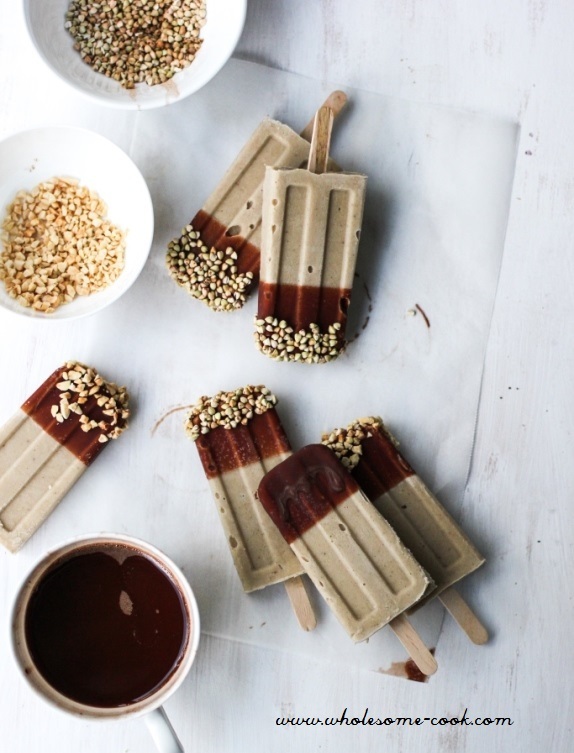 Oh yes, while these festive ice pops do contain traditional fruit mince – hey, it’s Christmas and a little indulgence with friends and family is part of the deal, they can be made dairy-free and vegan. These are absolutely amazing with just the right amount of tang from unsweetened blackcurrant juice. Coffee lovers rejoice! This recipe by Cook Republic is for you. 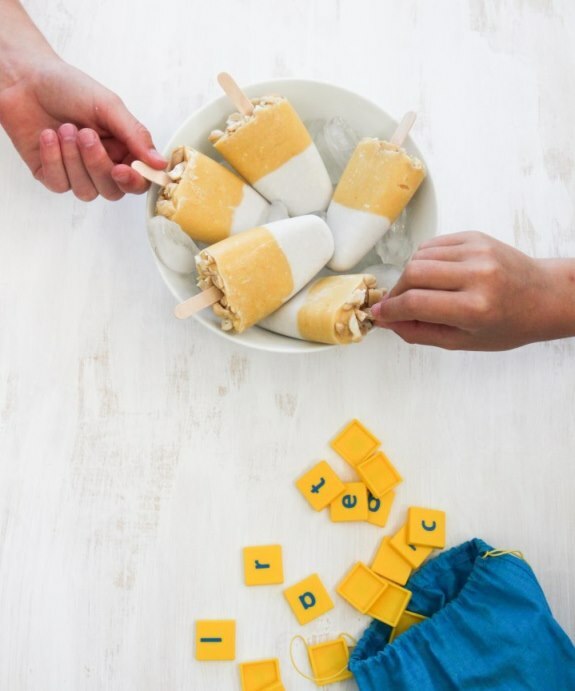 The team over at I Quit Sugar will have you and the kids covered this summer with these “weis” inspired pops – recipe is in the IQS Kids Book. Thank you for all these delicious icecream recipes. Just in time for summer. What a fantastic roundup. I adore ice cream and having some healthier options up my sleeve is always a good thing. These all sound so good I wouldn’t know which one to try first! Delicious treats! I should try those healthy ice cream and ice-pop recipes at home too. More practical, not to mention safer!